Have you wanted to give your students more autonomy? Listenwise just made some changes that will help you create student-driven activities and assignments. 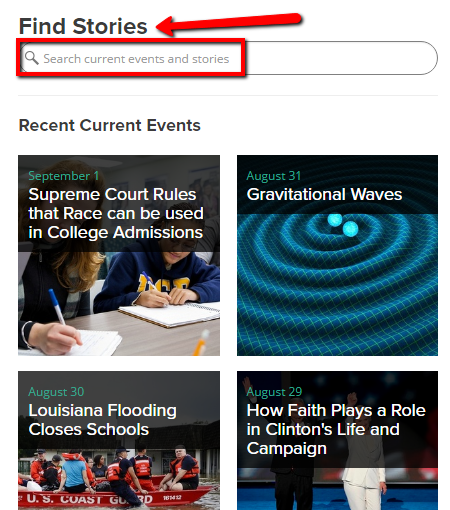 We’re excited to share that our search features are now available to students too! While reading a novel in class, encourage your students to find Listenwise stories related to that text. They might search for book titles, related news stories, interviews with the author, or prominent themes such as “injustice” or “heroes.” Then, ask your students to compare and contrast the Listenwise story and the events in your class novel. This activity will help students see the connections between literature and their lives. Encourage students to use Listenwise as a potential resource while they work on research projects. As they browse the Internet and books for information on particular topics, suggest that they search through our library to find relevant radio stories. Your students will likely appreciate that our content is concise, full of information, and easy to understand. Furthermore, the stories may help learners explore their topics from new or surprising angles. While your class studies a particular conflict or war in history, invite them to find Listenwise stories about other conflicts from our past or present. The search feature may lead them to stories about World War I, Vietnam, the Syrian Civil War, and more. As they notice connections between the events you are studying and the Listenwise stories, they will learn more about how conflicts throughout history unfold. Use our Current Events Debate series to inspire persuasive essays or speeches. Students can begin by typing “debate” into our search bar in order to find topics that interest them. Each student might listen to several stories before choosing an issue that feels most compelling or personally relevant. Then, students should form opinions on their issues and present their arguments, reasoning, and evidence through essays or speeches. Teach students media literacy skills by inviting them to create their own radio stories. Students might start the process by searching our library for Listenwise stories that seem interesting. After they each choose a story, encourage students to research, organize, and write a follow-up radio segment on the same topic. Their projects should add new perspectives or voices to the conversation. Finally, students can record themselves reading their stories and share the results with their peers. However you choose to use our student search features, we hope that they empower learners in your classroom. Whether you choose one of the options above or implement other creative ideas, we’d love to hear from you. Share how you are using student search in the comments below!